What if I wanted to fight? We premiered this track in our set at Qlimax 2014. Since then we've received tons of messages about the release date. 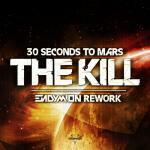 Well, we decided to release our rework of 'The Kill' on our soundcloud today!